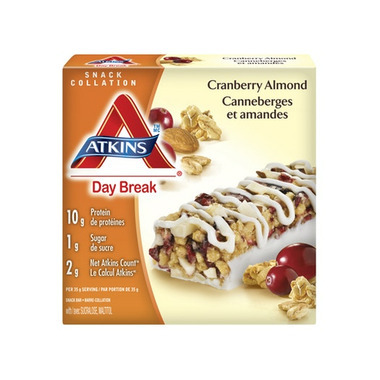 Cranberries and almonds have always been great together, and this bar keeps the streak going. Crunchy granola, tart-sweet cranberries and tasty almonds. Good morning. Vitamin mineral mix (Dicalcium phosphate, Vitamin A palmitate, ascorbic acid (vitamin C), niacinamide, riboflavin (vitamin B2), thiamin mononitrate (vitamin B1), folic acid, d-alpha tocopheryl acetate (vitamin E), soy lecithin, milk protein isolate, sucralose. This product is manufactured in a facility that uses peanuts, other nuts, and seeds. Contains: soy, almonds, milk, peanuts, coconut, sulfites. This product is manufactured in a facility that uses peanuts, other nuts and seeds. This product contains glycerine which is not a carbohydrate but has 4.32calories per gram. It taste good, not too sweet, but not very filling.